Equity Mutual Fund: Growth or Dividend - Which is Right Choice? For a new investor first selecting the mutual fund and then selecting of the above 3 options this may be overwhelming. In this post we tell you why you should opt for Growth option while investing in Equity or Equity oriented Mutual Funds. Budget 2018 has introduced long term capital gains tax of 10% on equity and equity based mutual funds. Along with this it also introduced 10% dividend distribution tax (DDT) on dividends given be equity mutual funds. Though both seems equal but as they say Devil lies in details. Dividend Distribution Tax on Equity Mutual Fund Dividends are 12.942% (not 10%). Now DDT is charged on the concept of “Grossing Up”. We would give an example to make the concept more clear. Suppose the investor receives Dividend of Rs 100 from his equity fund. This means he loses Rs 12.942 as tax. Hence the tax rate for DDT comes out to be 12.942% where as its only mentioned as 10%. So for any equity mutual fund investment, Growth Option where Long-Term Capital Gains would be applicable is much more tax efficient than Dividend Plan (where DDT would be applicable). Do remember that Dividend distribution tax is paid by the fund house before distributing dividends to its investors. The dividend received by investors is tax-free in their hands. As budget 2018 states the LTCG on equity mutual funds are applicable only after the gains in a financial year is more than Rs 1 Lakh. So if you have gains of Rs 50,000 the entire amount would be tax free while in case you have Rs 2 lakh capital gains, still only Rs 1 lakh would be taxed. So even on gains on Rs 2 lakhs, the tax would be Rs 10,400. However, if you had invested in Dividend plan, there is NO exemption limit and entire dividend is subject to DDT. Growth plans are more suited for long term wealth creation. Why? This is because dividends received are non-substantial most of the time and hence used in the regular day to day expenses. Since there is regular pay out there is no impact of compounding. However in case of growth plans the returns get compounded year on year and there is substantial wealth creation in the long run. When People use Dividend Plans? Lack of Awareness: Some people are not aware about Growth Vs Dividend plan and select something randomly. For regular income: Some investors have a misconception that dividends from equity or balanced funds can be used to generate regular income. Unfortunately, its not true and regular dividends are only possible if the fund generates regular profit. While this may be sustainable in regular bull market but a bit of correction in the market and this regular dividend would vanish. For booking profits: There are investors who choose dividend plan as it helps to book regular profit without them having to redeem funds. This may be good strategy but needs careful planning about the dividend received. Also Read:Child Plans from Mutual Funds – Should you Invest? Equity Mutual Fund: Growth or Dividend? Tax Efficient way to Regular withdrawals? As we see that Dividend Plans of equity mutual funds are inferior to their growth counterpart but in case you still want to replicate dividend plan for regular income or profit booking we have two tax efficient ways for you. Redeem when you want to: This is especially true for people looking to book profit at regular intervals. Just redeem partially when you want to! Use SWP (Systematic Withdrawal Plan): This is for people who want to use fund for regular income. You can set-up SWP which would pay you regular amount every month. This is much tax efficient way of generating regular income. But remember using Equity or Equity based balanced fund for regular income is not a good idea as correction in market would heavily dent your portfolio. Also Read: How SWP in Debt Funds is better than Fixed Deposit for Regular Income? Why you should wait for 1 Year before switching? Switching is considered as redemption from one fund and investment in other. Since its redemption, this involves concept of capital gains. If the investment is less than 1 year, the gains are treated as Short Term capital gains and taxed at 15.6% including cess while the Long-Term gains are taxed at 10.4%. Also Read: Which is the Best day for SIP in Mutual Fund? 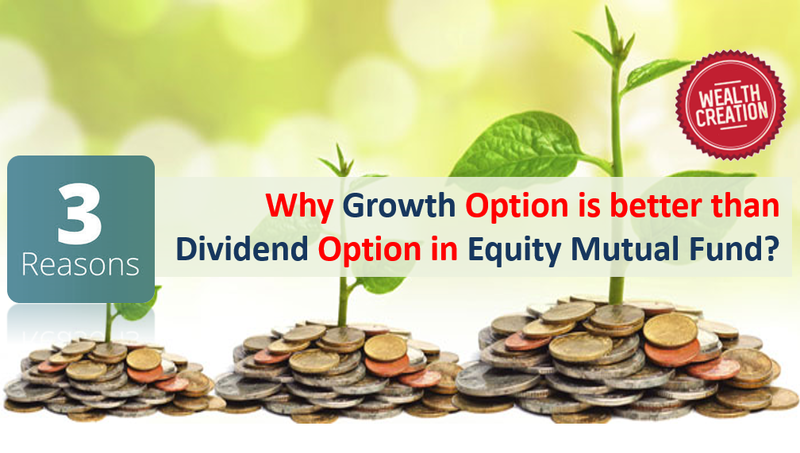 Equity Mutual Funds: Growth Vs Dividend Option? With Budget 2018 proposing Long term capital gains and dividend distribution tax on equity mutual funds, growth option is the way to go for their more efficient tax treatment and wealth creation in the long run. Why Investing in Mutual Fund NFOs is Bad Idea? Dear Amit, the 1st part of your illustration under Reason 1 is acceptable. On a dividend of 100, the DDT would be 10, the surcharge would be 1.20, and the 4% cess on 11.20 would be 0.448, so the total tax outgo would be 11.648. The investor would receive 100-11.648 =88.352. What about the 2nd part? If the investor got 100, then the “intended” dividend was not 11.11 as you wrote, but was 100×100 / 88.352 = 113.183629. Let us cross-check. 10% is 11.318363, then 12% of this is 1.3582, and 4% of [11.318363+1.3582] is 0.507063. Thus, the total deduction was 11.318363+1.3582+0507063 = 13.183626. So, the investor got Rs. 100. On the other hand, if we assume the intended dividend to be 111.11 as in your illustration, then 10% would be 11.111, surcharge would be 1.33332, the cess on this would be 4%[11.111+1.33332] = 0.497773, so the deduction would be 12.942093. So, the investor would get 111.11 – 12.942093 = 98.167907. Summing up, the tax rate is not 12.942% as you said, but 11.648%. On Rs. 100 it is Rs. 11.648, on Rs. 111.11 it is Rs. 12.942093, as you correctly pointed out. In any case, you seem to be the only one who saw that 10% DDT is not really 10%, but actually 11.648%! Take a bow and my sincere thanks! If the investor got 100, then the “intended” dividend was not 111.11 as you wrote, but was 100×100 / 88.352 = 113.183629. Let us cross-check. 10% is 11.318363, then 12% of this is 1.3582, and 4% of [11.318363+1.3582] is 0.507063. Thus, the total deduction was 11.318363+1.3582+0507063 = 13.183626. On the other hand, if we assume the intended dividend to be 111.11 as in your illustration, then 10% would be 11.111, surcharge would be 1.33332, the cess on this would be 4%[11.111+1.33332] = 0.497773, so the deduction would be 12.942093. So, the investor would get 111.11-12.942093 = 98.167907. Summing up, the tax rate is not 12.942% as you said, but 11.648%. On Rs. 100 it is Rs. 11.648, on Rs. 111.11 it is Rs. 12.942093, as you correctly pointed out. You seem to be the only one who saw that 10% DDT is not really 10%, but actually 11.648%! Take a bow and my sincere thanks!